ADI and Wilde Dieren de Tent Uit have condemned The Hundred-Year-Old Man for its use of an abused circus elephant. The film is directed by Felix Herngren and premiered in The Netherlands on April 20th, opening in cinemas across the country on May 1st. The elephant used in The Hundred-Year-Old Man, Vana Mana (also known as Wana Mana), previously featured in a shocking undercover exposé by ADI at the Great British Circus in the UK. 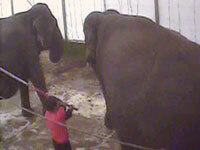 Vana Mana and her companions Sonja and Delhi were beaten by both her trainer and groom and chained for long periods. The Hundred-Year-Old Man bills itself as a comedy but there is nothing funny about the shocking abuse of the poor elephant who features in it. Experts agree that the use of wild animals in the entertainment industry causes suffering. Animal lovers should avoid The Hundred-Year-Old Man and other films that use live, performing animals instead of CGI. The abuse of animals for the entertainment industry is becoming more widely known and rejected by the public and the film industry. Directors Rupert Wyatt (Rise of The Planet of The Apes) and Darren Aronofsky (Noah) have chosen to use CGI for their extensive animal scenes. Acknowledging the suffering of animals in entertainment, in 2012 the Dutch Government announced plans to ban the use of wild animals in circuses following many years of lobbying by Wilde Dieren de Tent Uit.